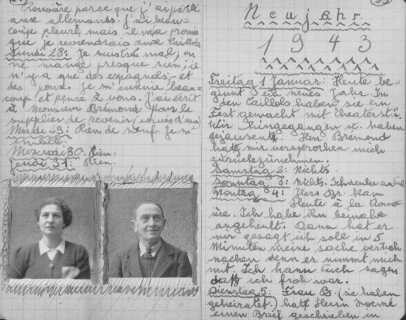 Page from the diary of Peter Feigl, a Jewish child hidden in the Protestant village of Le Chambon-sur-Lignon. The photos show his parents, who perished in a concentration camp. The text is in French and German. Le Chambon-sur-Lignon, France, 1942-1943.